After several thousand years of careful astrological-tracking, pretty much every single full moon that graces our night sky does so with the lore and legend of many moons past. Best viewed on Saturday and Sunday nights, this month&apos;s &apos;hunter&apos;s moon&apos; will not disappoint. As Universe Today points out, the hunter&apos;s moon is considered the first full moon after the harvest moon—the full moon that occurs closest to the fall equinox. Tonight&apos;s hunter&apos;s moon, as MSN notes, is also considered a supermoon, owing to the full moon phase arriving close to when the moon&apos;s orbit brings it closer than usual to earth. The moon&apos;s lore dates back to to pre-columbian times. Guided by the full moon&apos;s light, legend has it that hunters would use the full moon to track and kill deer (at their fattest) in order to build food stores for the impending winter. While our civilization of Prius-driving, Chipotle munching louts will certainly not be using the moon as usefully as our predecessors, there&apos;s always something romantic about looking up at full moon. Moonrise on Saturday night will happen at 6:23 p.m., just a few minutes after sunset at 6:19 p.m. On Sunday, moonrise will occur a bit later at 7:07 p.m. The full moon will be visible through the whole the night on both nights, setting after sunrise on Sunday and Monday mornings respectively. 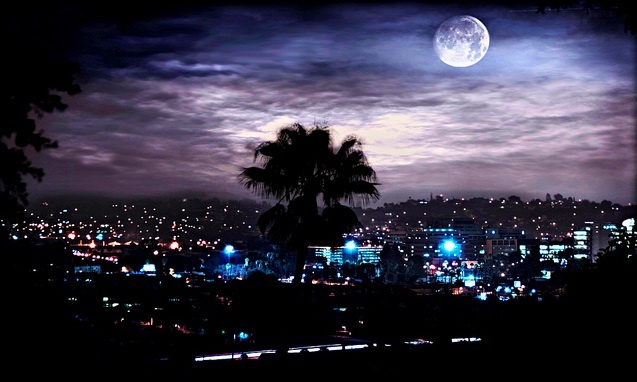 If you fancy yourself an evening drive to stare at the moon, there are lots of good places to look at the moon away from L.A.&apos;s notorious light pollution. We outlined directions to three good spots (the Angeles National Forest, Malibu and the High Desert) in this post from earlier this month, on the Draconids meteor shower. Be warned, however: full moon nights aren&apos;t necessarily the best nights for general stargazing, for reasons I hope are immediately obvious. The name &apos;hunter&apos;s moon&apos; refers to the bygone practice where humans hunted for their food using tools, skills and intellect honed over thousands of years of practice and tradition. Pretend that Donald Trump is elected President of the United States, modernity and our industrialized society concludes and we all find ourselves back in the stone ages by October of 2017. Do you have the skills, tools and intellect to feed yourself, as our ancestors once did? Moon lore follows that the during a supermoon, the celestial body&apos;s closer-than-average proximity means its gravity has a more pronounced than usual effect on earthly activities. Lore follows that seismic and volcanic activity are often elevated during supermoons. While scientists say this lore is a bunch of hooey, consider the fact that the San Andreas Fault is "locked, loaded and ready to roll." Do you have the skills, tools and intellect to feed yourself and your loved ones in the wake of a major (questionably supermoon triggered) earthquake? If not, we have a guide. Are we alone in the universe? And, as a corollary, is it more unsettling if we are or we are not?